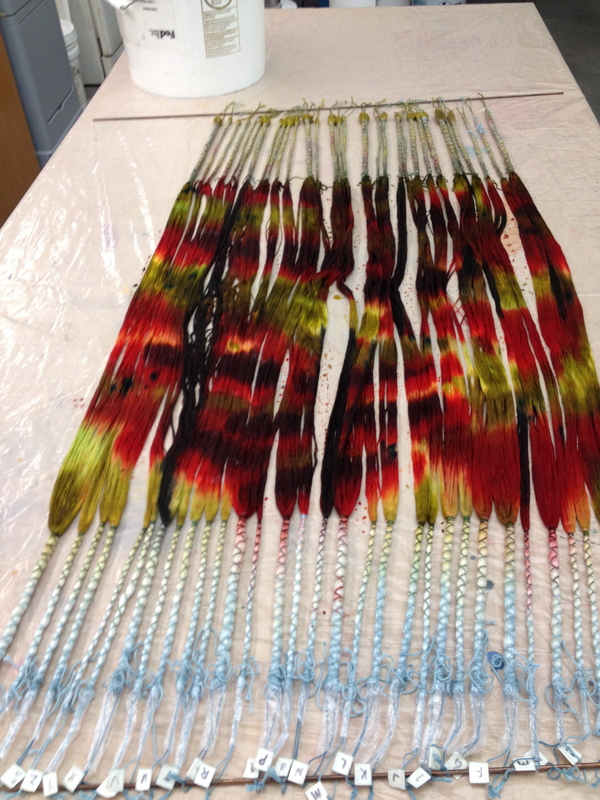 I have started a new weft-faced ikat project. Ikat is a process where the yarn is dyed, in a pattern, before it is woven. Once the weaving starts, a the pattern emerges. Weft-faced ikat is all about color placement. No warp yarns are exposed (remember, the warp is the long threads on the loom). This piece will have rich autumn colors in an abstracted landscape scene. This is the first set of ikat bundles. 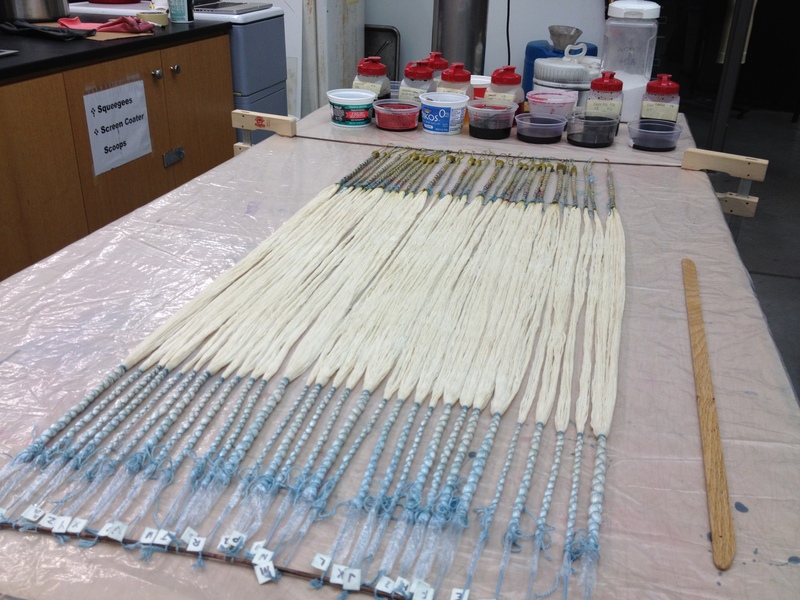 I label each section so that the bundles, the yarns will be woven in a particular order. The bundles will be dyed in pale blues on one end and the other end dyed in deep green and gold. The middle section, seen on the roll is raised so it won’t take dye in this round. 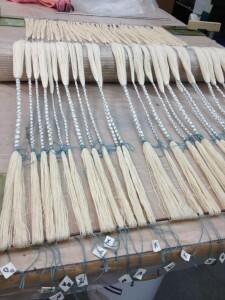 The middle is fully exposed when bundles are re-wrapped with ikat ties, as seen in the next photo. Forgot to take a photo after these were dyed…so fast forward to the re-wrapped set of bundles. Each bundle is re-tyed to hide the dyed area and expose a new section. 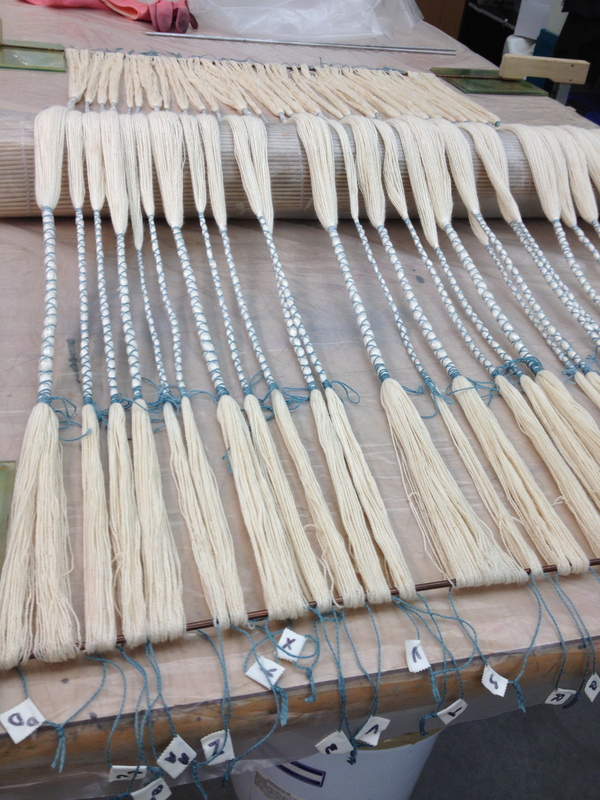 The middle of the bundles are now exposed and ready for dye. I use a direct application method where I paint the dye solution (3%) full strength onto the fiber. The painted set of bundles. The dye sets for about an hour and then another hour of rinsing is needed to remove the excess dye. Can’t wait to take the ties off to see all the colors.